The versatile and sturdy UPlift Commode Assist can be used in any room as a bedside commode and converted easily for use on a toilet. For safety, it automatically locks into position when fully depressed. 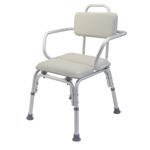 With or without assistance, the UPlift Commode Assist absorbs 80 percent of the person's weight to gently lower to a sitting position and smoothly lift to a standing position. It lifts only as needed, allowing the user to maintain muscular strength. The commode bucket slides out for easy cleaning. Includes splash guard and lid. 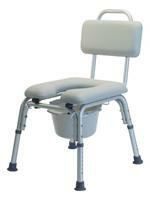 The removable back rest allows for easy positioning over the toilet. Base dimensions measure 20-1/2in x 25-3/4in . Seat dimensions measure 16-1/2in x 16-1/2in and seat height adjusts from 17in to 23in . The lift raises the seat 20 degrees up to 10in . Coated steel frame supports 80 lbs. to 230 lbs.